Julia Nyberg, who wrote under the pseudonym of Euphrosyne, earned the reputation of being the only truly talented female poet of the Swedish Romanticists. Julia Nyberg was born in 1785 into the home of the factor of the Skultuna brass factory. When she lost both of her parents at the age of 13, the factory owner, Carl Jakob Adlerwald, became the guardian of her and her siblings. He ensured that she attended a girls’ school in Stockholm from 1800 to 1802. This school was run by a French couple called D’Ariès. At the school Julia Nyberg studied French, Swedish and music, in addition to the usual women’s handicrafts. After leaving school and until she married for the second time Julia Nyberg provided for herself partly by teaching and partly by working in the household at Skultuna. Her first marriage in 1809 to the silk merchant Johan Henrik Asping was not a happy one and was marked by her husband’s financial difficulties. They separated in 1818 and were officially divorced in 1820. In 1822 she remarried to Anders Wilhelm Nyberg, bookkeeper, and later factor, of Skultuna factory. He had an interest in literature and supported her throughout her career. Alma Nyberg didn’t have any children. 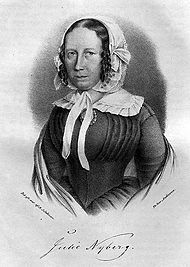 It was reading works by Romanticists – particularly the poems in Poetisk kalender, 1811-1821 – which came to have a definitive influence on Julia Nyberg’s own writing. “It was only through acquaintance with the so-called new school that I first came to understand myself”, she wrote in her retrospective on Lorenzo Hammarsköld on 2 April 1821. In 1816 she approached P.D.A. Atterbom and sent him some of her drafts. She signed the letter as Laura and requested that he reply to Mademoiselle Laura Euphrosine Ström. He published three of the poems accredited to Euphrosyne in Poetisk kalender for the year 1817 and this became the start of a new authorship and a long-lasting collaboration. Julia Nyberg’s method of dissemination was through calendars, journals, newspapers, anthologies, songbooks, and even pamphlets. Her first collection, entitled Dikter, was published in 1822. It was followed by Nyare dikter, 1828, a two-volume set called Samlade dikter, 1831-1832, and Nya dikter, 1842. Julia Nyberg wrote mainly lyrical poetry but also shorter romances, and versified plays and versified tales. Her only published piece of prose is the story “Cunigunda” from Nyare Dikter. Her poetry conveys the Romanticists’ conceptualization of poetry and love as links to the divine, and of poetry as the interpreter of man’s longing to find his soul’s rightful home. When she chose narrative or historical themes she emphasised the determined and loving female. The play Vublina, 1823, was inspired by a female commander from then current Greek so-called freedom war. Her writing also comprised religious, idyllic and romantic horror themes, contemporary issues and satirical poems and parables. Her contemporaries generally received her favourably, apart from strong critics of the Romantics and those conservative critics who opposed female authorship altogether. She was generally considered to be the most prominent female poet of the Romanticists, and by some even to be the most significant female poet in Sweden of all time. In 1829 Julia Nyberg was awarded the Swedish Academy’s gold medal in recognition of her talents. Male reviewers tended to promote the idyllic, simple and naïve aspects of her writings, along with the rich imagination and musicality she expressed. This contributed to her being dismissed as a hasty and unimportant copier of the Romanticists by Swedish literary historians of the early twentieth century. It was not until the emergence of feminist literary research that focus returned to Julia Nyberg. From the end of the nineteenth century one of her songs has remained a constant element in Swedish song culture – and in everyday speech, namely “Vårvindar friska” (originally “Den stackars Anna, eller Moll-toner från Norrland”). Julia Nyberg died in Skultuna in 1854. There is a street named after her in that town: Julia Nybergs väg. Christina Juliana (Julia) Nyberg (Euphrosyne), www.skbl.se/sv/artikel/JuliaNybergEuphrosyne, Svenskt kvinnobiografiskt lexikon (article by Gunilla Hermansson), retrieved 2019-04-26.